kirby stone, originally uploaded by jahansell. 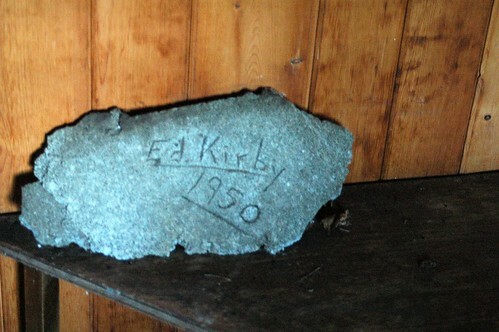 This stone, inscribed by Ed Kirby in (I assume!) 1950, is in the little cabin in the woods at Miles Sanctuary. I don't think I'd ever been inside before, but my girls tried the door and it was unlocked. It has a desk, a bed, and maybe a hearth, nothing more - oh and this little table. Ed is the town historian, and knows more about the sanctuary (and everything else in town) than just about anyone - if he sees this (JN, can you help?) perhaps he'll share the story behind it.